A high quality material design to suit a luxury modern home. With such a fabulous setting, scale and striking modern architecture this property suffered from a very poor mismatch of materials and poor previous workmanship. My brief was to evaluate what could be done as an attractive, fitting and durable linking detail around the house from the large entrance area to the swimming pool. With fabulous cars in the driveway and beautiful woodland views over manicured lawns this property needed sleek high quality details. 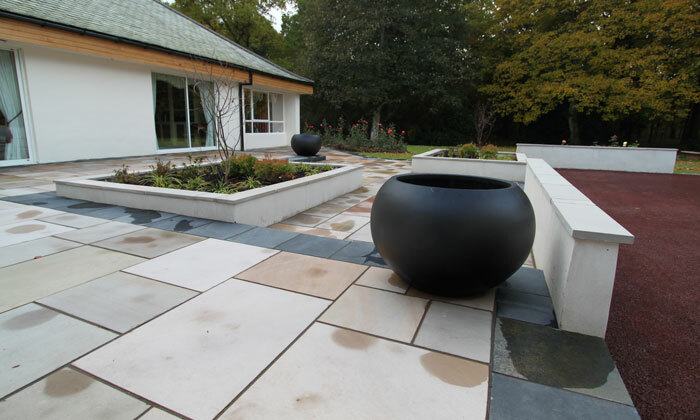 After much development of ideas, earning the trust of the client a sleek dressed stone detail with contrasting trim and low slung rendered planters was agreed. The finish was beautifully fitting to the quality and character of the surroundings and the client was relieved that after many attempts they had found a good designer and design to realise all the potential they wanted.